Murphy, aka Silent Stanley, is a 2-year-old fawn male born August 20, 2006. His sire is WW Apple Jax and his dam is Ale Insurance, making his grand sire the famous Irish-bred Fortress. Murphy, like Louie, has no documented races to his career, as it was decided early on that he was not as competitive as others. Murphy's cat test: When Murphy figured out that the kitties were moving, live creatures he became way too interested. No cats in his future, please. Introduction to small dogs will come at a later date. 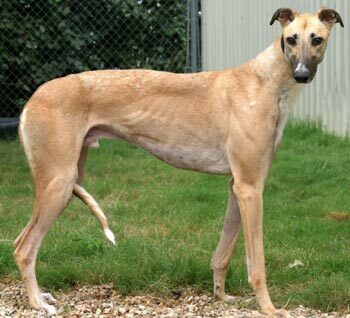 Murphy is truly a gentle giant – a large Greyhound with a reserved air about him. 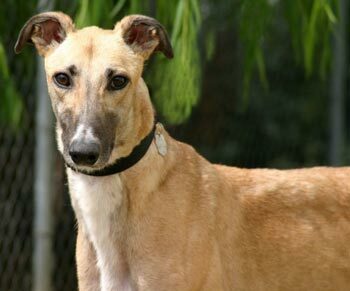 He is strikingly handsome – fawn with a black muzzle and eyeliner, with a dramatic white “splat” on the back of his neck. His throat is white, as is the tip of his tail, but it’s the white underside to his tail that looks so unusual when he wags it! 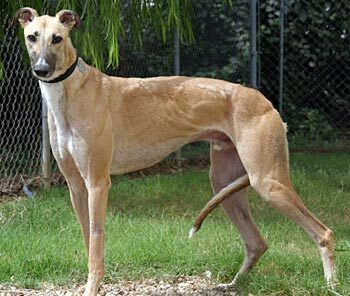 Murphy has opened up here with the other Greys – he’s the one that leads them on mad dashes around the back yard – UP on the deck, OVER the stairs, around the wall, over the wall, and back. The girls bark madly when he’s in front, and he enjoys himself immensely. He’ll go carefully through the dog door (remember he’s tall!) but he uses it with no problem. Sometimes he’ll take a squeaky toy out through the door so he can play with it outside, and he generally doesn’t remember to bring it back in. We’ll have to work on that. Murphy mastered the stairs in just a couple of days – he didn’t want to be left alone downstairs. My PC is upstairs, and Murphy has managed to work his way from the dog bed farthest away (the one the other dogs didn’t want to lay on) to the one closest to the desk. He has done this through sheer persistence, never a growl or an evil look – just slowly edging his way to where he wants to be. He’s a smart dog! Murphy will trot into his crate when it’s mealtime, but he’s not very happy being crated when I leave for a while. He settles down nicely, though, and seems to relax till I return. He sleeps quietly on a large dog bed in the bedroom, and will even share the bed with another Greyhound. Murphy was visibly shocked that I told him “no!” when he jumped on the bed – he tried it again to see if I meant it, then decided that he didn’t want to be on the bed anyway. He’s never tried to get on any other furniture, so it’s a mystery as to the attraction of the bed; I guess my girls are a bad influence. Murphy came here shy and unsure; he is growing more confident day by day, and remains as loyal and affectionate as always. He is a GREYT dog!